This isn't a new book - it was published in 2010 - and I've had it pretty much since it first appeared on the shelves...I have read it countless times, and have never stopped loving it. Isn't it a gorgeous cover? It's the UK one. Jaclyn Moriarty has to be one of my favourite YA fiction authors. Her books have this ability to be very, very real, and also seem to depict this ever so slightly unattainable, glittering world - it's hard to explain. There's a quality to her novels that makes you feel as if the characters are both gloriously perfect and yet, fragile. There's a childlike element to some of them, especially Lydia, a naivety that could either come from being sheltered, or from just being an eternally happy optimist. Her books often change viewpoints regularly. The first book I read of hers was Finding Cassie Crazy, and I fell in love with how she uses various mediums like the letters, notices on noticeboards, notes and Lydia's Notebook (which claims to teach you how to be an author). But it's Dreaming of Amelia we're talking about today, and that uses the form of the Australian HSC English exams and eassys, minutes of meetings (see next paragraph), blog posts and comments, and a few letters thrown in for good measure. And also another form which I cannot mention because it might ruin part of the plot for you, but as you can tell the book is very much character-led. 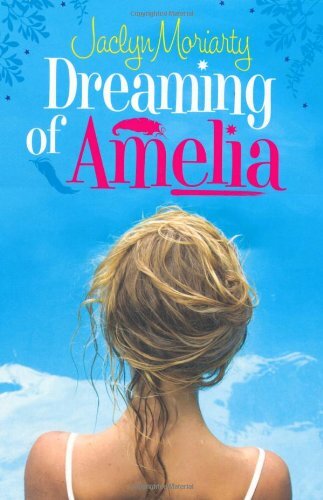 Dreaming of Amelia deals with a large amount of character viewpoints, but Jaclyn Moriarty handles this extremely well and each voice is compeltely distinct. If you've read the previous books, you'll immediately recognize Emily and Lydia, and the teachers. (Yes, she documents meetings of a certain committee of adults!) Then, there's Toby, and of course, Riley and Amelia. Riley and Amelia have transferred to prestigious Ashbury High for their final year. The other pupils at the school become obsessed with them - they are people who are just out of reach, who seem to walk around with an invisible confidence while keeping mainly to themselves. Oh, and they are totally devoted to one another. However. It wouldn't be story unless there were secrets to unravel, pasts to uncover, shadows being cast. And boy, does Jaclyn Moriarty do this well. You're immediately pulled in by Riley's irresistible, both dark and light, cool, almost poetic voice (did I mention he's gorgeous, too? ), as he's the first character you come across. He and Amelia have known each other for years, but somehow he knows she's kept something from him. The characters are about to join the adult world; they are on the cusp of leaving school and a lot of them will be going their separate ways. If these changes are not enough, new students in the last year are certainly something to talk about, as well as romance (and not just Riley and Amelia - one of my favourite characters from the previous books, Seb, returns) historical fiction (done in a similar style as Alex's story in Revolution, it adds another dimension to the book) and several ghosts (Oh yes - if you're a fan of the supernatural, there's something for you in the book, too). The climax comes very quickly, despite the book being pretty long - it's the kind of book you have to invest in, because you really will need time to get stuck into it, as well as the fact that it is unputdownable - and even though you might think all the build up was unnecessary, it really is, because there are so many story arcs running under the surface. Some readers may want to read the previous books by Jaclyn Moriarty, which are a little shorter, to get used to her writing style and get all the facts that are referenced in this book. I never felt overwhelmed by all the intertwining stories, though. Perhaps that is just me, but somehow it seems that Jaclyn Moriarty has pulled off an impossible task in combining so much in this book. Yes, at times you think the scenes don't matter, but really, all the little details come together eventually. Yes, sometimes the characters come across as slightly unrealistic, but then again the book is written at times in an otherworldly prose anyway. This book deals with several themes, but I did think some of the word count would have been better spent dealing with these in greater detail. Otherwise, it's a brilliant read, and I will always love it. In less than five words: unputdownable, captivating, gorgeous, interesting, fab. Excerpt to follow in another post, probably not today, only time to do a Music Monday, probably.